Eric is an associate in the firm’s Legal Services for Businesses, Families and Individuals and Trusts and Estates practices. He concentrates his practice in corporate, tax, real estate and trust and estate law. Eric’s corporate and tax law experience includes providing guidance in entity selection, attending to entity formation, assisting in the state business registration process and preparing organizational and governing documents. In addition, Eric structures, negotiates and drafts agreements for shareholder buyouts, buy-sell arrangements and operating agreements for all types of closely held businesses organized as corporations, limited liability companies or partnerships. With a multidisciplinary background in tax accounting and business law, Eric possesses a comprehensive knowledge of a myriad of business transactions and an understanding of the tax consequences of such transactions. Eric’s estate planning experience includes counseling individuals, families and their businesses. 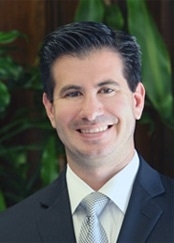 In particular, he designs individualized estate plans, drafts Wills, Trusts and other legal documents to effectuate the lifetime and testamentary transfer of assets in a manner that minimizes income, estate and gift taxes for clients and their future family generations as well as handles all probate matters and estate administration matters. Prior to joining the firm, Eric served as judicial law clerk to the Honorable Vito L. Bianco, Judge Tax Court of New Jersey.